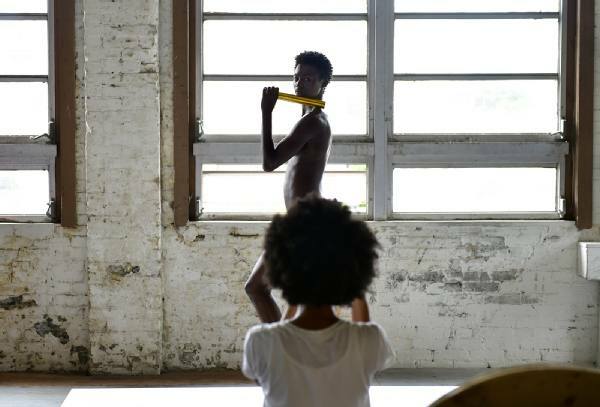 Brooklyn-based photographer (and our favorite vegan + natural beauty goddess) Dana Scruggs, recently shot the Fasest Woman in the World, Olympic gold-medalist and model Tori Bowie for ESPN's 10th edition of their iconic Body Issue making Dana the first Black female photographer to contribute to the Body Issue. Her raw approach to both her art and her life inspires us to hold ourselves accountable, and to continuously show up for ourselves and our communities by using our voices and sharing our perspectives from a place of receptivity, compassion, respect and of course, realness. Reflecting on her journey to this moment in her career as a Black female photographer in a male dominated industry, Dana shares: "Representation matters not just in front of the camera but behind it as well. Brands, mags, & galleries need to look at how they may be feeding into a culture that’s not inclusive of Black women and not inclusive of women of color. It’s not enough to have Black women in your magazine, ad campaign or grace the walls of your gallery. As artists, our voices have been underrepresented and underemployed for far too long. Make the effort to seek us out... MAKE THE EFFORT TO BE INTERSECTIONAL." Dana's capture of Tori Bowie in all her natural has us completely awestruck at the immense beauty. She captures a level of depth in this body study. Tori's composure and self-confidence evokes a rare type of beauty captured by Dana in a way that truly celebrates the power and energy of the athletic form, the grace and strength of femininity, and unapologetically natural, Black beauty in her signature aesthetic. "Shooting for Body has been one of my top goals since I became a photographer. The fact that it happened - even though I’m not well known, even though I don’t have a slew of big name clients in my portfolio, EVEN THOUGH I’m just a Black girl from the Southside is a testament to how staying true to who you are as an artist will ultimately pay off. I’ve struggled to be taken seriously by the industry, I’ve struggled financially, I’ve struggled with believing in myself and in my aesthetic when almost no one was interested in my work or in hiring me. Even though I’ve been in NY nearly 6 years - my career has only started to significantly move forward in the last 6 months. I’m saying all of this to motivate anyone - ESPECIALLY BLACK FEMALE PHOTOGRAPHERS - to not give up. Keep creating work, even when you feel uninspired, burnt out, and constantly dejected by rejection." "Intermittently, I go through periods of feeling depressed about my work. Feeling like it's not good. Feeling like it's not good enough. Feeling like I'll always be a struggling artist and that my work will never fully support me financially or give me a comfortable life. I went through a period of sincerely fearing for my future, wondering constantly if I'd ever be able to retire when the time comes. Since moving to New York, I've grown as an artist - but, I've also been rejected and passed over a lot when it comes to brands or mags hiring me for jobs. I felt, for a long time, like it just wasn't going to happen for me: creative success and financial success. I still have that fear, but it's smaller... Long story short, I feel very motivated right now. I feel like I've turned a corner creatively and mentally." "Taking time to process my work, mentally and creatively, instead of churning out shots has been transformative. It's giving me the opportunity to see my work with new perspectives. It's also allowed me to give myself permission to step away from my work if I'm just not feeling it...yet." Self-Portrait by Dana. "For the first in my life, I'm really starting to love my body..."
"We love ourselves more than ever. I'm proud that after a lifetime of hating and straightening my hair, I've become grateful for my natural texture and fullness (I got a lotta hair). Black people everywhere are embracing their skin tones, shapes, and heritage in an unprecedented way - and that is so incredible to behold." "I never thought that I would not have acne. Through my teens and throughout my adulthood I had severe cystic acne. I tried every product, saw multiple dermatologists, and tried every random remedy that I could find. When I became vegan and started using natural skincare products, my skin became clear almost immediately. When I stopped wearing makeup my tone evened out and my skin became even healthier. I still have acne scars and my skin isn't perfect...but I've never loved it more. A vegan diet changed my life. If you have skin issues, or if you simply want healthier skin, #govegan. You are what you eat." "Six years ago, I decided to become a vegan. In doing so, I became a healthier person - not just physically, but mentally and spiritually as well. I became more compassionate towards ALL LIFE - not just human, but also toward the chickens, cows, fish and pigs that I'd consumed my whole life without a thought as to how much suffering they endured before they ended up on my plate or before they were shoes on my feet. Meat and dairy production contributes to over 50% of global greenhouse gas emissions - which is one of the main contributors of climate change. There are literally LAKES of feces and waste from these factories that are poisoning our soil, our oceans, and our ozone. It takes over 2,400 gallons of water to produce 1 pound of meat, but it only takes 25 gallons of water to grow 1 pound of wheat. We're misusing and abusing our natural resources! We will not be able to survive on this planet for much longer if we don't start changing the way we eat, the way we treat animals, and if we don't start treating the Earth with Respect..."
"I'm feeling grateful, even though I often feel like every day is a battle for productivity, for financial stability, and for recognition. Just like a lot of people, I'm trying to figure it all out in the midst of feeling overwhelmed and alone...sometimes you just gotta be real." Model Video Portrait: Adonis Bosso @ DNA Models by Dana Scruggs from Dana Scruggs on Vimeo.